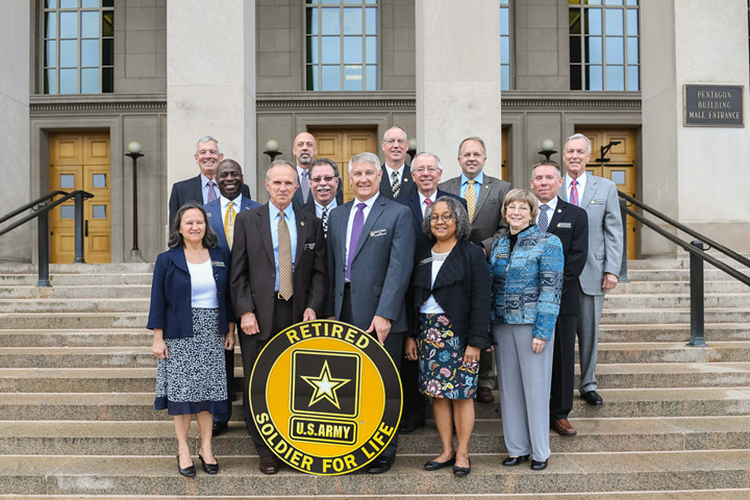 Bridging the communications gap between the retired community and the Army was the overarching message at the 2017 Chief of Staff, Army Retired Soldier Council held at the Pentagon in Washington, D.C., April 23-28. The 14-member council, co-chaired by retired Lt. Gen. Jim Lovelace and retired Sgt. Maj. of the Army Ray Chandler, also addressed other concerns and aspirations of the Army’s retired community with 16 senior leaders, including Army Chief of Staff Gen. Mark A. Milley and Sgt. Maj. of the Army Daniel A. Dailey. The council is administered in accordance with Army Regulation 600-8-7, Retirement Services Program, and its charter, which is approved by the Secretary of the Army. “The retired soldiers have heard the call of the Soldier for Life (SFL) program. The SFL Program communicates that Army values are forever … along with the desire for continued selfless service. “In or out of uniform, we are Soldiers for Life, and your 965,000 retired soldiers are an underutilized resource of your team. We do not see it as merely a jobs program. “We need only to hear clearly your mission for us … communicating how and where you want us to serve. “We will help hire veterans, inspire the next generation to serve in the Army, and connect the Army with Americans in hometowns everywhere we live. The council members reviewed and discussed 30 issues submitted by nine installation retiree councils. Seven involved health care issues, 12 related to benefits or entitlements, and 11 concerned enterprise level communications, retirement services, or other areas. Some of the major issues included concern for benefits and entitlements. For example, the recent change to fold TRICARE Standard and TRICARE Extra into TRICARE Select, which will create new annual premiums and increase co-pays and catastrophic caps for retired soldiers. Across the spectrum of the retired population, access to care has been an issue for a number of years. The council commended the Army surgeon general for her commitment to increase access to the maximum extent possible. In the past year, the retired community has seen an increased availability of appointments compared to the previous year.